Classification and Regression are two major prediction problems which are usually dealt in Data mining. Predictive modelling is the technique of developing a model or function using the historic data to predict the new data. The significant difference between Classification and Regression is that classification maps the input data object to some discrete labels. On the other hand, regression maps the input data object to the continuous real values. The discovery of model or functions where the mapping of objects is done into predefined classes. A devised model in which the mapping of objects is done into values. Algorithms Decision tree, logistic regression, etc. Regression tree (Random forest), Linear regression, etc. Classification is the process of finding or discovering a model (function) which helps in separating the data into multiple categorical classes. In classification, the group membership of the problem is identified, which means the data is categorized under different labels according to some parameters and then the labels are predicted for the data. The derived models could be demonstrated in the form of “IF-THEN” rules, decision trees or neural networks, etc. A decision tree is fundamentally a flow-chart which resembles a tree structure where each internal node depicts a test on an attribute, and its branches shows the outcome of the test. The classification process deal with the problems where the data can be divided into two or more discrete labels, in other words, two or more disjoint sets. Let’s take an example, suppose we want to predict the possibility of the rain in some regions on the basis of some parameters. Then there would be two labels rain and no rain under which different regions can be classified. 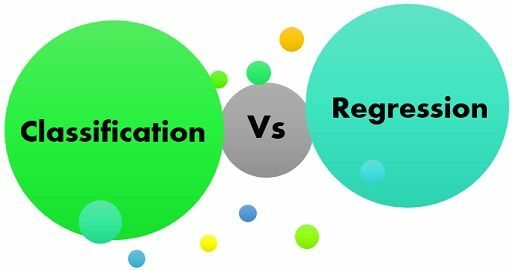 Regression is the process of finding a model or function for distinguishing the data into continuous real values instead of using classes. Mathematically, with a regression problem, one is trying to find the function approximation with the minimum error deviation. In regression, the data numeric dependency is predicted to distinguish it. The Regression analysis is the statistical model which is used to predict the numeric data instead of labels. It can also identify the distribution movement depending on the available data or historic data. Let’s take the similar example in regression also, where we are finding the possibility of rain in some particular regions with the help of some parameters. In this case, there is a probability associated with the rain. Here we are not classifying the regions within rain and no rain labels instead we are classifying them with their associated probability. The Classification process models a function through which the data is predicted in discrete class labels. On the other hand, regression is the process of creating a model which predict continuous quantity. The classification algorithms involve decision tree, logistic regression, etc. In contrast, regression tree (e.g. Random forest) and linear regression are the examples of regression algorithms. Classification predicts unordered data while regression predicts ordered data. Regression can be evaluated using root mean square error. On the contrary, classification is evaluated by measuring accuracy. Classification technique provides the predictive model or function which predicts the new data in discrete categories or labels with the help of the historic data. Conversely, the regression method models continuous-valued functions which means it predicts the data in continuous numeric data.